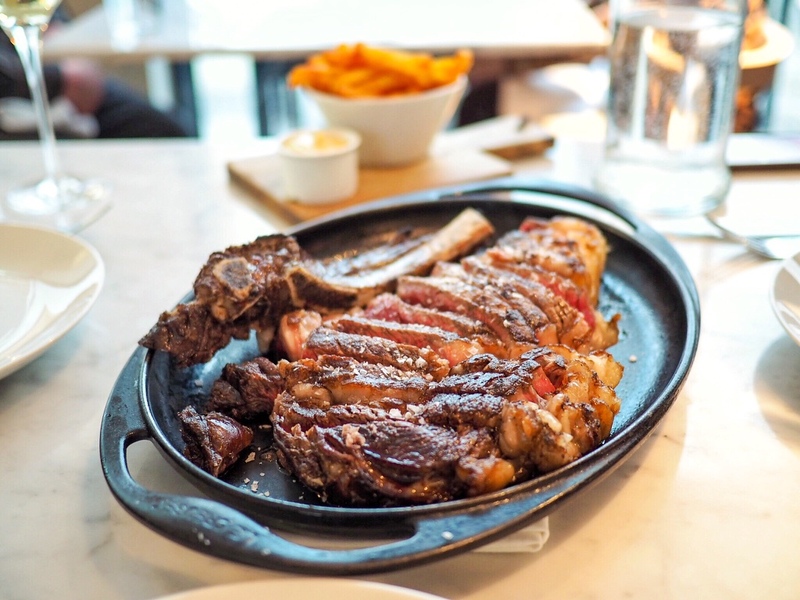 Donastia, Lurra's sister restaurant, has the honour of being on my list of banned London restaurants. Oh yes, the list is real and it is lengthy. 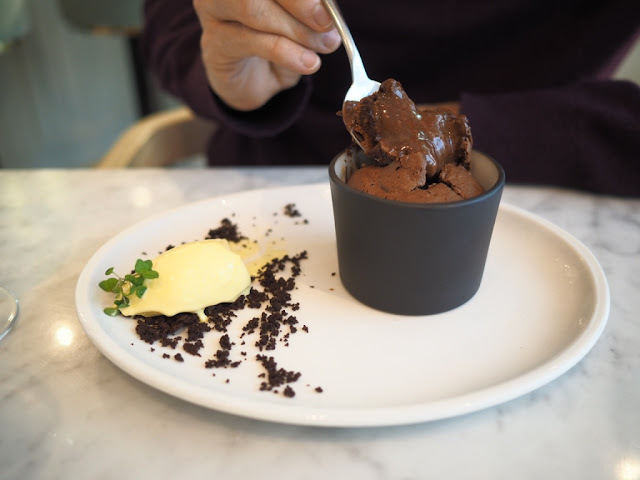 I wanted to like Donastia when it first opened but, a bit like Lurra, some of the dishes failed to hit the mark. Donastia's overcooked pluma was unforgivable while their mini wagyu burger was a pale imitation of the drool-worthy iberico burger at Opera Tavern. That's not the reason for the ban though. Donastia is the only restaurant in London where the staff turfed me off my table at the end of my allotted 2 hour dining slot. 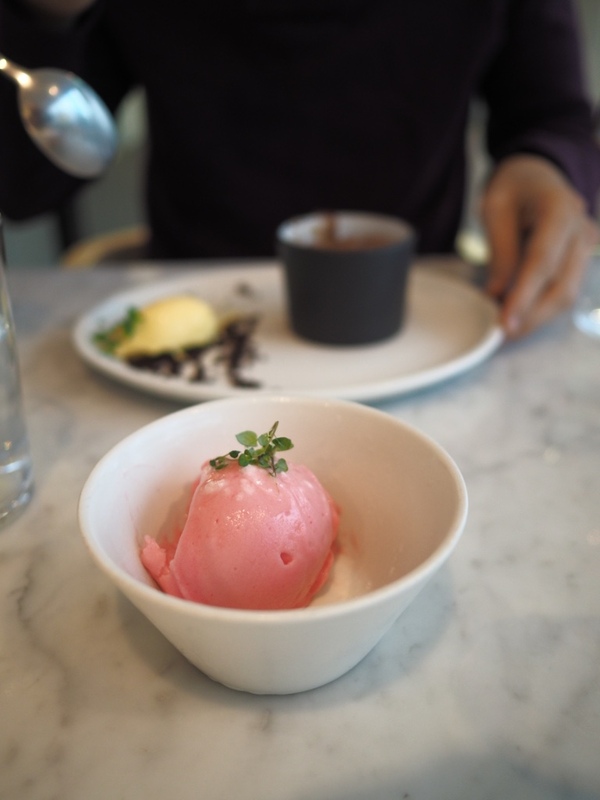 We were handed the bill and our coats with the last bites of dessert while a couple stood next to the table. Needless to say, I haven't been back. Lurra wasn't like that though, but to invoke a sporting analogy to describe the food, there are a lot of swings, a few hits but no home runs. Lurra subtitles itself a Basque Grill. It's not really, but it makes a decent attempt at replicating the dishes you will find around San Sebastien and the hills of Bilbao. I'm not claiming to be an expert on the rustic dishes of the Basque, but my meals there benefited from being cooked in close contact with burning embers. The food at Asador Etxebarri was so memorable because of the nuanced use of smoke in most of the dishes. Lurra adds old vine twigs to its fire, but they imparted little to the flavour of the dishes I had there. It's a missed opportunity to create something incredible. I'm being a bit picky, but by and large I liked Lurra and plan to return. We started with a number of small plates. 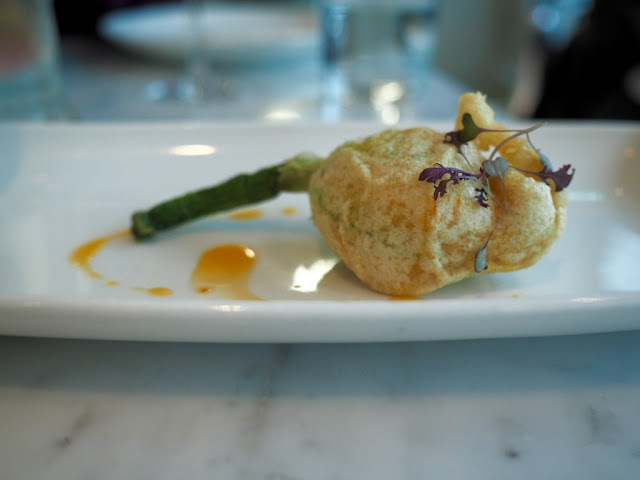 A courgette flower stuffed with cod brandada lacked lightness with an oddly thick coating. The filling was quite substantial and this size made it slightly too large to eat solo, but it was also a messy mouthful to share as a tapa. The brandada had a decent fishy flavour though. For £7.50 each, this dish was overpriced by about £2 in my view, and there are better courgette flowers in London. Salt Yard charge £4.50 for their brilliant version stuffed with goats' cheese. 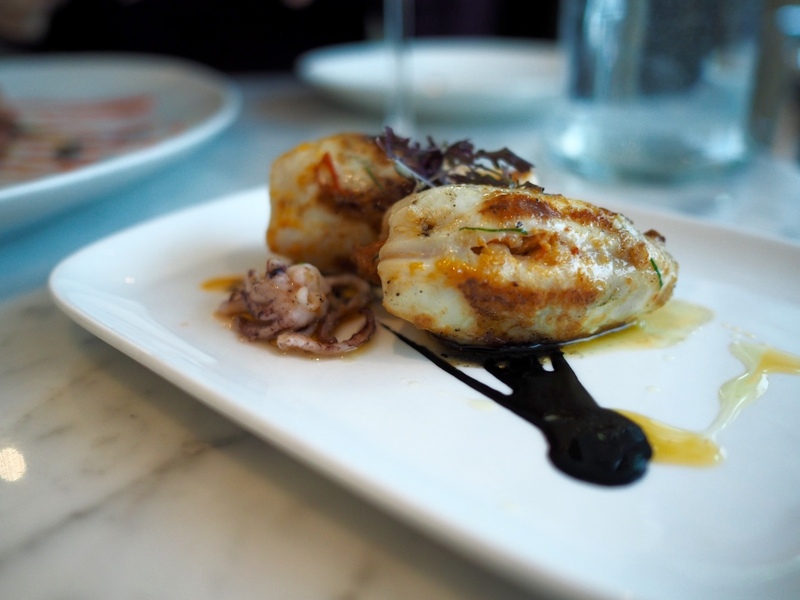 Squid stuffed with prawns and chorizo (£13) promised much but lacked on the execution. The squid body was stuffed with small prawns and chunky hunks of well spiced chorizo, but I thought it was a little on dry side. I probably wouldn't order it again. We got back on track with the hake koktxas pip-pil (£7) which were terrific. 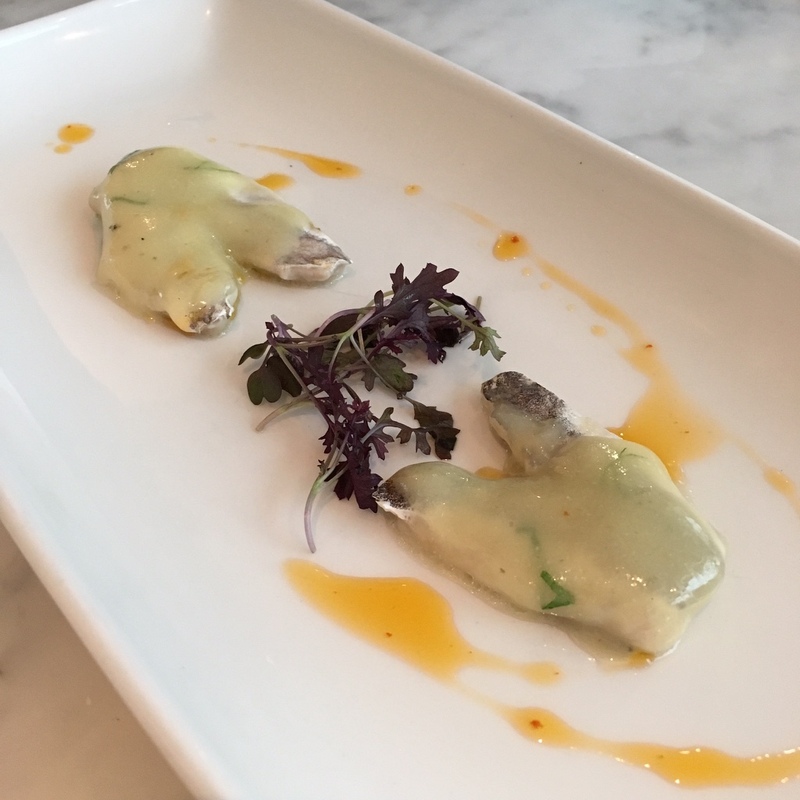 The gelatious cod throats were very tender and the pil pil sauce was plate-lickingly good. Bread and butter, is charged at £3 for three half slices, but the quality was a far cry from the sourdough you get from Hedone via the Antidote Wine Bar for £4. The striking grilled octopus was almost a ten out of ten dish. 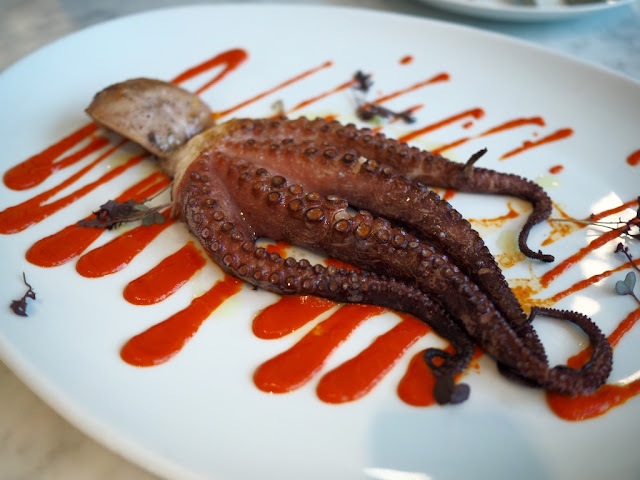 The tentacles and head were tender but still juicy and the dish would have been a complete knock out had there been a more noticeable whiff of smoke about it. The piquillo pepper sauce was great, but to be honest I'm not a huge fan of squeezy bottle drizzle plating. It looks a bit too Duck & Waffle to me (evidence here, here, here and here but I could go on). I'm also not a fan of multiple blobs of sauces or gels or vertically placed vegetables, but I digress. The two large sharing plates, which are the climax of the menu, evoke the famous dishes of the region. 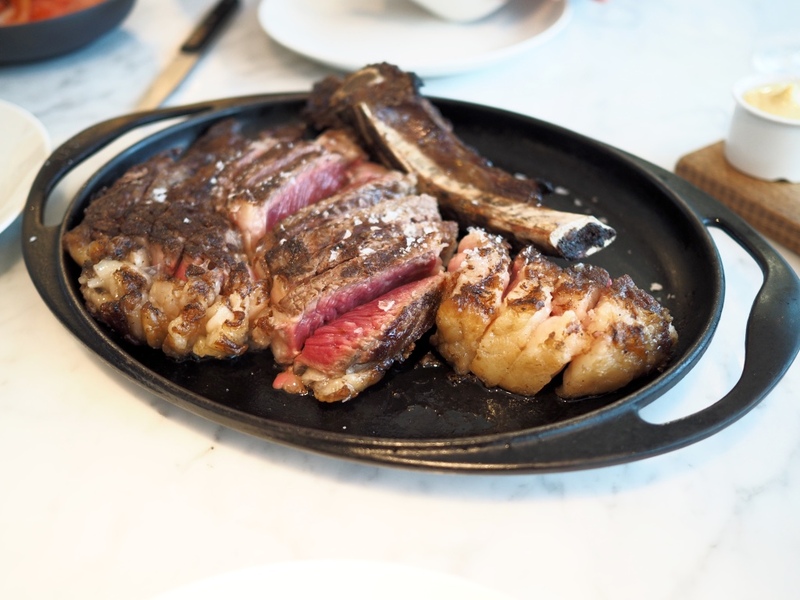 We chose the Galician Blond prime rib (£71) over the turbot and added some side dishes. I don't think I've had a better tomato salad than the one at Lurra . It must be the Feo de Tudela tomatoes. Even at £6, I'd order it again. The grilled red peppers were similarly sensational (£6). I wasn't won over by the fries though - maybe it was the price (£6!). The kilo of beef was grilled nicely and cooked rare and juicy, but once again I couldn't really taste any smokiness to it. Still, it is a terrific cut of meat with a huge flavour. Is steak worth £71? Probably not, but I'd be happy to eat this again. How we had room for dessert I have no idea, but we kept it relatively light. A scoop each of wonderfully flavoured banana ice cream and rhubarb ice cream (£2 each) really hit the spot. The chocolate fondant (£5.50) had a lustrous molten shine once the set shell was pierced. It was glorious. We drank a fair amount which pushed up the bill, but I was catching up with a friend I hadn't seen in ages. 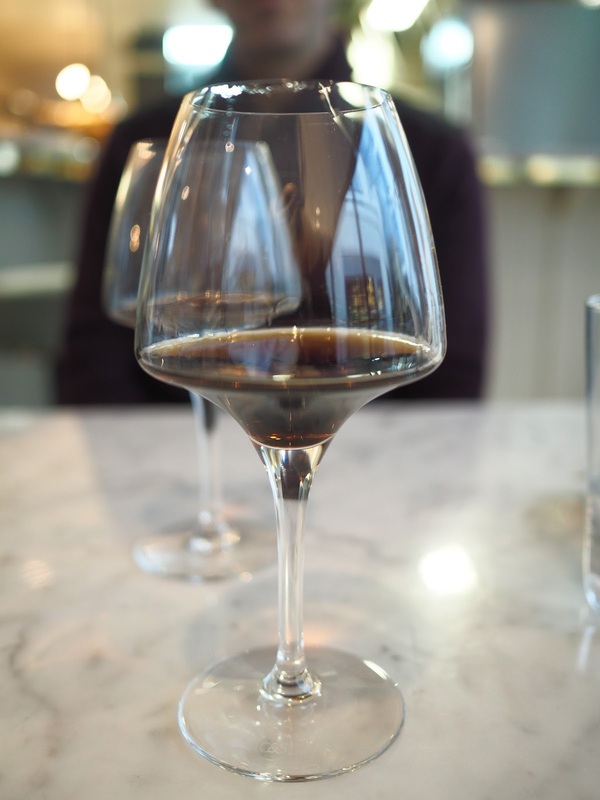 The Placet (£49) and the Remelluri Reserva (£59) were both great, and we finished with a few glasses of PX, although at £6 for a small pour it was priced a bit on the steep side. I'm happy to say the service at Lurra did not invoke the trauma of Donastia, although the largely Spanish staff were a bit over-eager. If there are ever a few stray prawns or chorizo on a plate, I will eat them. I'm not called the Insatiable Eater for nothing. I found myself mentally slapping the plate-reaching wrists of the Lurra staff and I worry that one day I actually will lash out and probably end up with an assault charge. Watch this space.